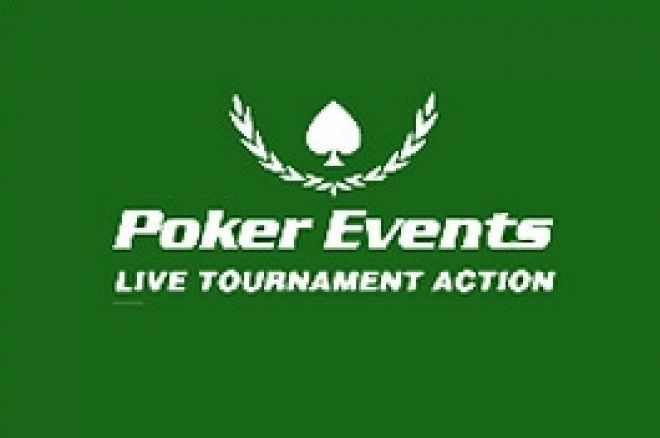 This is Part II of an account by Irish poker star and World Speed Poker Open Champion Oliver Boyce, of his play in the PokerEvents Dublin Cup, a big-money qualifying satellite for the PokerEvents/Boylesports Irish Open to be held in June. In Part I, Oliver explained how he had just scooped a couple of decent pots to catch up with the early chip leaders and was now well-positioned to make a solid attempt at securing one of the 12 qualifying seats up for grabs at this event. I'm not a big believer in defending my blinds, but I've noticed one player in particular who keeps raising my blind by 3 times the blind when it's my big blind or small blind and he's doing it in mid-position. He's already been involved in a few big hands and when he gets called he bets the flop aggressively. So I've no real reason to doubt that he's not got a hand as he's not being forced to show a hand at this stage, but my instincts say he's at it and I need to defend my blind against him soon. I'm again on the BB and he raises up to 1,200 with the blinds being 200/400 in level 5. I look down and see A9, not a massive hand, but maybe a hand to make a call with and I'll be first to bet out after the flop, so I'm hoping for a rag flop and then a push on the flop. The flop comes AJ9 rainbow and I've hit two pair, I smile at him and check, he bets a pot size bet, I think about it for a minute and push all-in, he calls with AK and I've now added another 10k to my stack to finish level 5 with 30k and still up with the chip leaders. After this, I found AK and limped into the pot, knowing the player on the Big Blind will push with any Ace. Like clockwork, she raises to all-in and I call, she flips over A8, the board pairs twice to make it a split pot, this is the second time I've outplayed this player in a big pot and we've ended up splitting it, she goes on to make the final table. But I reckon she's been all-in nearly 200 times during the event. Later again, one away from the cut-off I find KK. There's only 3 players behind me and the blinds are 300/600; I put in a minimum raise hoping someone will call and hit or make a move to protect their blinds; the player in the cut-off thinks about it for ages and then goes all-in. The small blind then pushes her stack (this is the same player I've already split two pots with). I'm reluctant to call here, but feel I'm priced in, so call. I show KK, the player in the cut-off shows 55 and the small blind also shows KK, this kind of luck stops me from getting up with the chip leaders and making a real challenge for the title. Unfortunately this is as good as it got for me, as I now went card dead for a while, at this stage. Paul Lecky (top pro player from N. Ireland), Dave O'Callaghan (2nd in the Barcelona EPT 2005), Noel Furlong (Main Event Winner WSOP 1999) and Tom Murphy from Antesup team are all on my table. Noel Furlong is also the chip leader now with over 70k and Dave O'Callaghan has about 50k. One hand in particular that stands out for me and is a weak aspect of my play is when I found A9 on the button. Paul Lecky raised UTG and made it 3 times the blind, to about 1,200, it folds around to me and I've played with Paul before and know he likes to raise UTG to show extra strength, I decide I could push him off his hand, as his stack was only 14k, leaving him in the position of going all-in preflop or folding. This would be aggressive play by me and not something that I 'm known for, but I want to use my position here to pick up the blinds and keep my stack at 30k, so I re-raise Paul by 3k. The big blind and small blind both get out of the way and I can see that Paul doesn't like the reraise. Now Paul is one of the best players at reading other players, so I'm trying to egg him on for a call here and want to look confident, but not over confident, I know I don't want to see a flop and I'll find it hard to call an all-in bet, but I'm 90% sure that he's at it here. He takes ages and I consider calling time on him, Paul likes to play with his chips a lot before making a move, he tries to find a bet which will get the other player off the hand. I'm thinking at this stage, the longer it goes on, the better the chances are that he'll fold, so I didn't really want to call time on him, which was a mistake in hindsight, as I think I gave him too long to think about the situation. He then announces all-in and pushes his 13,5k stack forward, it will cost me 10k more to call and I can afford it, as it will leave me on 16k, but I'm now thinking that he's got a monster hand, AA/KK because he's overdone the acting. I decide to let it go, even though my instincts say I'm ahead, he shows K5 and we both laugh about it and I then tell him I was at it also. Soon after this at level 10, the biggest pot of the night occurs when Dave O'Callaghan raises to 3,600 with the blinds now 600/1,200, Noel Furlong is in the big blind and I'm one away from the cut-off. Now Dave likes to raise a lot preflop, so I don't pay much heed to his raise, which is also a problem when he does have a monster hand, I look down and see K10 suited. I fancy a flat call here and sense none of the players behind me have much either, but I realise it would be a loose call and I don't really have enough chips to make that move with, so I give it up. Noel decides to flat call in the big blind. The flop comes AQJ with two hearts, I would have flopped the nut straight and I'm now disgusted at myself, but Noel bets out 15k, Dave immediately goes all in and Noel calls. Noel has 98 of hearts and Dave has trips Jacks. At this stage there's almost 120k in the pot and I would have been ahead, but the two players have loads of outs, so I'm happy enough to be out of it. Neither player improves the hand and Dave has now crippled Noel and is a monster chip leader. Dave now goes on a run of bullying the table like all top players do when they have the chips, he now has raised my blind 4 times in a row and Dave knows that I don't waste chips defending my blinds. I look down and find I've KQ and its only me and Dave, I decide against the flat call as I reckon I can take Dave off his hand here with my 28k stack preflop, so I decide to push all-in, he calls and shows AQ and Ace on the river puts me out of the tournament. I'm not too disappointed with my play here as I would have been right more times than wrong, but Dave has been hitting all the flops and going up against the chip leader was not the right thing to do, but I want to stand up to him and make myself look strong at the table. So I end up going out in 53rd position and 35 places away from the money. Dave O'Callaghan ended up finishing 3rd, which I feel was a slight injustice as he played fantastic poker in the first day, but a dry run in the 2nd day of the event stops him from defending his title. When it was down to the last 3 players, he ran his AQ into the AA of Paul Hanlon. The top two players did a deal at heads-up to collect 15k each and Paul Hanlon took the title with Ray McKenna taking second place, so congratulations to all the final table players and to Poker-Events again for an excellent tourney. Ed note: Enter some big poker events when you Download Bet365 Poker where a seat to every WSOP tournament can be won.